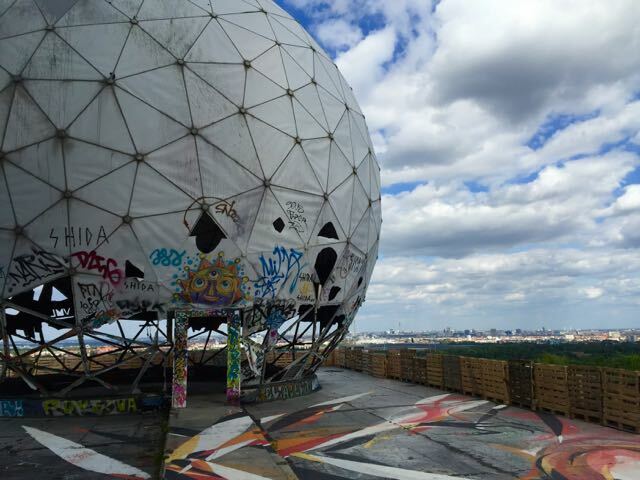 Teufelsberg (literally Devils Mountain) is one of the coolest spots in Berlin. A few years ago it was still possible to sneak through holes in the fence and roam around the old ruins of the former spy station. This changed however in 2011, when the holes in the fence were closed and the areal could only be visited with a guided tour. Now a new leaseholder is in charge who wants to create an orderly tourist attraction out of the wild and rundown place. A development that can be witnessed throughout Berlin. 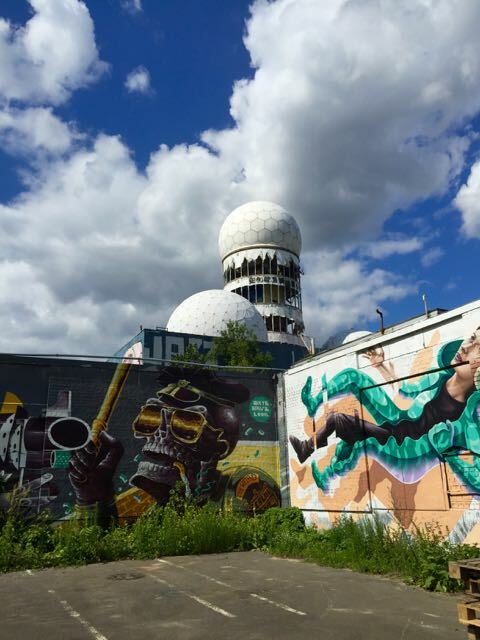 Teufelsberg is located in the beautiful Grunewald, a big forest area in Berlin and is named after the Teufelssee (Devils lake) which is close by. When you are climbing the hill to get to the old spy station, it is hard to imagine that this part of land was totally flat until the end of the Second World War. This mountain is made completely out of rubble. The Nazis had started to build a military college there, that was destroyed after the war ended. On top of these ruins the rubble of thousands of bombed Berlin houses were piled up. During the cold war, the mountain was used by the Americans and British to install an intelligence-gathering station. They listened in to what was going on in the Eastern Block. When the spy station was abandoned in 1992 it was briefly used for flight monitoring purposes but after that it just decayed quite picturesquely. 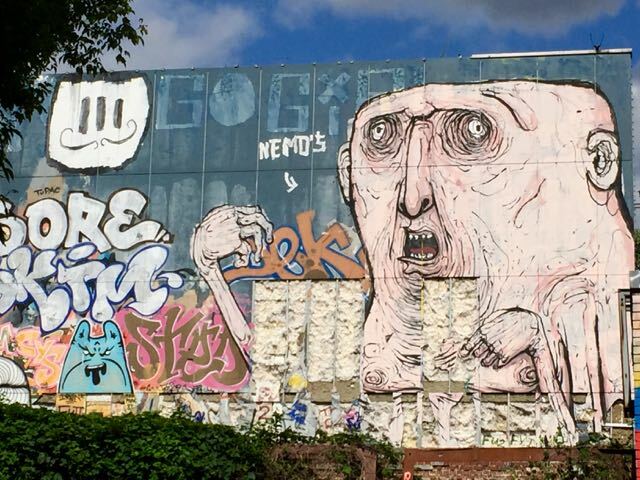 It did not take long for curious and adventurous Berliners to find ways inside this complex and to roam around. This ended with the guided, commercialized tours, when all secret entry wholes were closed off. The ruins are still not entirely safe to enter. The former tenant did not only open the complex for paying visitors but also to street artists who were invited to spray paint the many walls. This decision has led to the creation of one of the most interesting and unique street art galleries amidst breathtaking ruins. With most of the side walls gone, the view over Grunewald and the surrounding area is amazing. 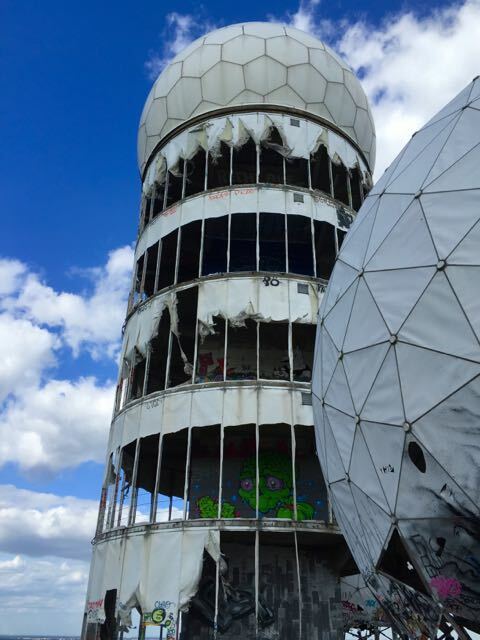 If you climb even further up you will have a spectacular 360 degree view over the forest and lakes and in the distance you can see of course Berlin. The whole site is somewhat surreal and morbid and this is exactly why it is so appealing. It is easiest to arrive here by car. If that is not possible, you can take the s bahn and then walk or bike there. It is quite far so do not forget to bring something to drink with you. The site is now operated by a new company and they do not seem to have an English version of their homepage yet. We hope, this will change soon. If you are interested in a tour, you can either mail them, or click on the button “Ticket kaufen” which means “buy ticket”.